Thanks to 2005 Boards member Shark Jumper for letting us know that Transformers Robots In Disguise Returns In US McDonald’s Happy Meal In December. This is a different promotion from the ones we usually see. This time is a toy train promo with characters from promotions they had in the past and one of the carriages got characters from our most recent series: Transformers Robots In Disguise. You can check the mirrored image after the jump and then you can share your impressions at the 2005 Boards! Vintage G1 Sludge Brontosaurus Dinobot Transformer 1980-84 RARE LQQK!! Complete! That’s how Transformers: Robots In Disguise came into our lives. With three years of Transformers entertainment and becoming the third longest running Transformers cartoon series to date, RID 2015 is now coming to an end. The final episode of Transformers: Robots In Disguise will air in the United Kingdom at 7:30AM via Cartoon Network on November 4th, 2017. Titled as Freedom Fighters, United States will see the same episode on Saturday, November 11th on CN. Transformers: Robots in Disguise was produced by Hasbro Studios and Darby Pop Productions in the United States, and animated by Polygon Pictures in Japan. Developed by Adam Beechen, Duane Capizzi, Jeff Kline featuring a star-studded voice cast of Peter Cullen, Will Friedle, Stuart Allan, Darren Criss, Ted McGinley, Khary Payton, Mitchell Whitfield, Constance Zimmer and many others, RID is a spin-off series to its predecessor Transformers: Prime. Thank you, cast and crew of RID. And thank you very much to all who shared, enjoyed and discussed the show. We’ll see you all with Transformers: Cyberverse. Entertainment Earth is now listing a 13th Warrior Class Wave featuring Bludgeon and Thermidor for a US-based release. The “new” wave is an alteration of Wave 12, but excludes Starscream, Windblade and Soundwave in favor of the aforementioned two figures and an additional Twinferno. 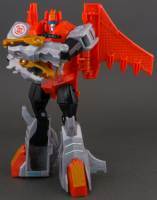 However, Legion Heatseeker and Cyclonus seems to be omitted from a US release as Sideswipe / Groundbuster / Twinferno wave is listed as Wave 10 but with no sign of Legion Heatseeker and Cyclonus Wave. 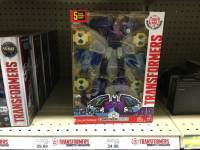 Reports have been trickling in over the last few days of Robots In Disguise Twinferno hitting US store shelves. A majority of the sightings have been found at Toys R Us and come from Colorado, New York, Virginia and Tennessee. At first, this leads us to believe that Wave 3 Combiner Force Warriors have been released but that may not be the case. The wave mates of Thermidor and Bludgeon are not being found yet. What is most likely happening is this wave of figures is currently shipping out which is mostly rereleases of older figures and a single Twinferno in each case. So, keep your eye out for Twinferno if you collect the RID line and we’ll report future sightings as Bludgeon and Thermidor hit shelves eventually. Hasbro held their Third Quarter 2017 Earnings Conference Call this morning to investors, journalists and other interested parties. Speaking to the audience, Hasbro CEO Brian Goldner stated “Transformers multi-screen entertainment continued to drive revenue growth in the franchise. Point of sale is up versus last year and up versus the last movie year. This fall we continue with new entertainment initiatives to engage our fans. The global home entertainment release of Transformers: The Last Knight took 6th place on September 28th and all-new episodes of Robots In Disguise and Rescue Bots are running on linear and streamed services. In addition, in partnership with Machinima, in November we are debuting the second chapter of the critically acclaimed Digital Animated series Prime Wars Trilogy…Titans Return. You can check out an Infographic summarizing the Third Quarter 2017 Earnings Conference Call, after the jump. Good news for all RID collectors. 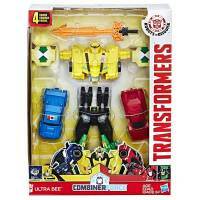 Thanks to fellow 2005 Boards member Rookbartley we can report that Robots In Disguise Combiner Force Team Combiner Galvatronus Was Spotted In US Retail. Galvatronus is the Robots in Disguise Team Combiners wave 2 and it was previously reported as listed or available online at Target, Amazon and other websites and it was out in some countries like Singapore, Canada and Australia This is our first sighting at US retail. The figure was found at Toys R Us in Ft. Wayne, Indiana earlier today for 34.99 Dollars. Happy hunting for all RID fans. You can click on the bar to see the attached image and sound off at the 2005 Boards! 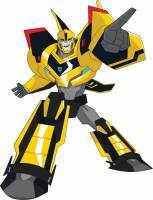 Robots in Disguise Season 3 Episode 23 Sick as a Bot Synopsis – Spoiler! TVPassport has added listings for Cartoon Network for 21 October 2017, and that includes a description of the upcoming episode of Robots in Disguise, Sick as a Bot. The synopsis reveals a new villain for the episode, named Wingcode, and sets up that most of the team are laid low with a virus. There’s a bigger spoiler in the description, too – this is an episode that will feature a guest star from Transformers Prime. Read on for the full description, with the spoiler character revealed, if you dare! We’re taking a break from bringing you galleries of the Titans Return line to spotlight one of the new releases from the Robots in Disguise line. Warrior class Twinferno might be the last new mold to grace the Warrior size class for the line, and he’s a different and quirky concept for a figure, which sums up the original characters of Robots in Disguise as a whole. Our second Twinferno of the year does not turn into a dragon, but rather a bizarre spaceship / stealth jet… with dragon heads. It’s a different type of airborne vehicle mode, and it’s nice to get some variety into the Robots in Disguise Warrior line which has mostly consisted of ground vehicles so far. Robot mode is solid, if a bit generic apart from the dragon hands. The head is particularly plain, and looks a bit like a background character rather than a named character. While very simple, the transformation is also a little frustrating as the legs proved hard to peg into place, and we’ve got concerns that the leg mechanism – which swings down on one plastic arm – may break in time, as it seems overly stiff and a bit of force is needed to make it peg in. 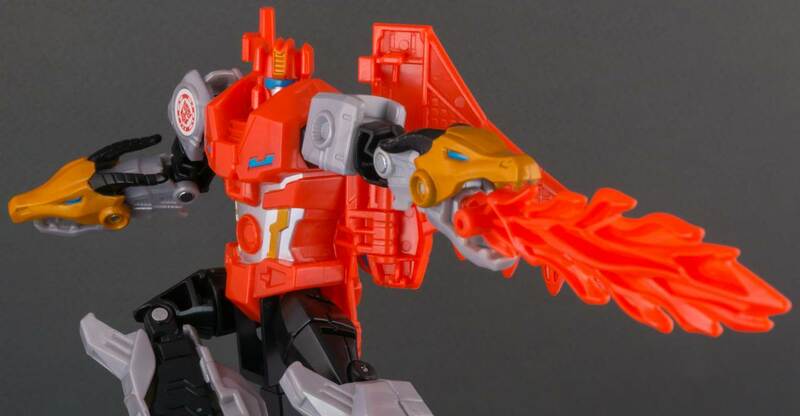 The flame accessories are fun, plugging into the dragon hands for fiery breath in either mode, and also attaching to the jet engines for a blazing engine trail – and these also work in robot mode, if you have ever wanted to pose a robot delivering a fiery kick to his enemies. Overall, an interesting and different figure with unique accessories, if a little flawed and generic in his robot design. Check out the gallery to see if he should go on your wants list when he hits US retail. 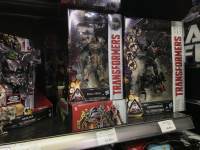 Via 2005 Boards member BB Shockwave, we can report that Transformers The Last Knight WAVE 2 Deluxes, RID Ultrabee And Menasor Are Out In Hungary. The figures are available in Galaxy Toyshop Hungarian Website. Wave 2 of the TF5 Deluxes (Drift, Slug/Slag, Steelbane and Sqweeks for 10 490 Forint (39.45 Dollars approximately) and RID Combiner Force Ultra Bee and Menasor are out too for 15 890 Forint (59.76 Dollars approximately). You can click on the bar to join to the discussion at the 2005 Boards. Keep reporting your sightings all over the world!